Google is reportedly working on an extension of its Hangouts live video service dubbed "Helpouts," which is said to turn it into an e-commerce marketplace for individuals and businesses. 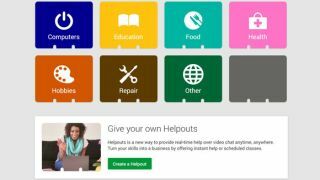 Google Helpouts would connect experts and advice seeks, spanning categories like computers, education, food, health, hobbies, and repair, according to sources speaking with TechCrunch. Although it's supposed to be a "secret project," rumored details and screenshots of the service paint a picture of seller profiles, reputation management, scheduling, payment features via Google Wallet, and of course search and discovery tools for buyers. Testing is said to have begun in late June and an initial Google Helpouts release date "may be at least a month away from a public release." Described as "live, real-time commerce," Google Helpouts is along the lines of expert-pairing services like eBay's Secretguru and TaskRabbit. Through Google Hangout video technology, it could set the stage for fee-based cooking classes without the hassle of having to travel to a distant location for the learning experience. Likewise, it could revolutionize language-learning services through the web, one-upping Rosetta Stone and most online classes that neglect to offer a fluent real-world counterpart to speak to. Computer repair could happen over an tablet, offering live feedback with every turn off a screw. Google Helpouts, if launched, may be great for start-up seeking individuals, and it could also help brands reach additional customers. To that end, Google is rumored to have partnered with companies including One Medical Group, Sears, Weight Watchers and Alliance Frances. However, whether Googlers - accustomed to seeking information from Google products for free - rally around a mostly fee-based service remains to be seen. It could end up being the next YouTube or fall by the wayside as the next Google Wave. Read the success of Google Play, one marketplace that is doing well.